Are you suffering from dry hands this winter? Our weather has been all over the place - 30s in the morning and then jumping to 70s in the afternoon. All that equals havoc on my hands and nails. 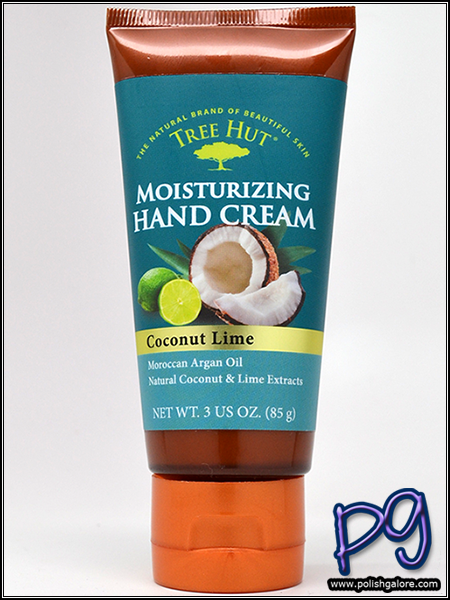 Today I'm trying Tree Hut Shea Moisturizing Hand Cream in Coconut Lime. This hand cream has a list of natural ingredients to help repair the skin, moisturize, promote elasticity, promote anti-aging, reduce sun damage, polish, condition and rejuvenate the skin. Whew. That's a lot coming from a hand cream. But with Certified Organic Shea Butter, Argan Oil, Lime Extract, Coconut Extract, Avocado Oil, Safflower Seed Oil and Chamomile Extact, it's easy to see how they can pack so many claims into a 3 ounce bottle. Did I mention the cost is only $5.99? Tree Hut Shea Moisturizing Hand Lotion is also paraben free, no DMDM (a preservative), made in the USA AND doesn't test on animals. But let's be real, I wonder "Does it smell good?" and "Is it greasy/oily"? From the above photo of the cream on my hand, you may be worried. Amazingly, this is definitely a non-greasy, non-oily hand cream while giving a feeling of moisturizing and conditioning. I was able to type within 10 minutes of applying. And the smell? Pure Heaven. Now, I love both coconut and lime, so that helps but it doesn't smell fake or artificial. It's also not so strong that you just smell like sunscreen and a margarita. A+ in my book. Tree Hut Shea Moisturizing Hand Lotion may be purchased in retail stores found through their website in three scents - Coconut Lime, Moroccan Rose and Tropical Mango. Because of the price point, I'm seriously looking and picking up the other two. And if you check out the retail store locator, you may be surprised - I'm able to find this hand cream at my local Wal-Mart! I didn't realize it was so readily available. Tree Hut has lines of scrubs, butters, sun protection, lotions, soakd and washes/soaps in a variety of scents. Join the conversation on social media by Liking them on Facebook, Following on Twitter, Following on Pinterest and Following on Instagram.